"How much trouble can one poet be?" Ah, you're about to find out of course. Strand Releasing has debuted a wonderful official US trailer for their upcoming release of Andy Goddard's Set Fire to the Stars, a black & white drama set in the 1950s starring Elijah Wood as an aspiring poet who ends up on a week-long retreat to save his hell raising hero, Dylan Thomas, played by actor/co-writer Celyn Jones. These two look like so much fun playing against each other, and I am excited to see their dynamic play out across the entire film. This first premiered at the Edinburgh Film Festival last summer, playing at a few other fests here and there, waiting for its release in the US until now. Might be worth the wait? "It's about feelings, sir…" Check it out. Based on true events, Elijah Wood stars as John M. Brinnin, the New York academic who brought Dylan Thomas to America. Celyn Jones plays the volatile celebrity poet – tormented by anonymity, alcohol and the abyss – who scandalized the Manhattan literati of the 50s and challenged Brinnin's hero worship of his work. In the face of the Welsh poet's wilder excesses in the Big Apple – angel, beast and madman – John has no choice but to hijack Dylan to a private retreat to get him ready for America. The days and nights that follow will change his life forever. Part literary biopic and – shot in cut-glass black-and-white – part love-letter to the American B-movies of the 40s and 50s, Andy Goddard's debut feature is both a character driven chamber piece and a cautionary tale about the fly trap of meeting your heroes. 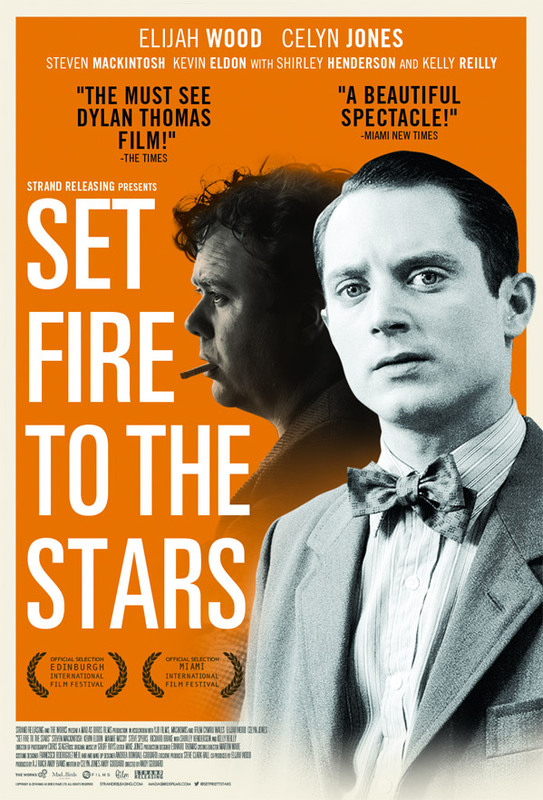 Strand Releasing will open Andy Goddard's Set Fire to the Stars in select theaters starting June 12th this summer.